1- Coach as usual I want to thank you for taking the time to talk with us. You always do and we really appreciate that. Since day 1 this fall your team seems to have a whole new attitude and way of going about things. They seem more confident and determined. Is this something that you identified as coaches going into fall practice that you wanted to change? The biggest difference is that the players are older and more mature. Much better leadership among the players. People tend to forget that two years ago we started a bunch of sophomores because they were the best we had. Last year they were all juniors, this year they are seniors and the light bulb has clicked on. 2- To follow up on that question, last year you were officially 4-1 going into region play (the Rock Hill OT loss was reversed due to RH using an ineligible player) just like you are this season. But again, it seems like the team is playing at a higher level this season, and also consistently at a higher level as well. Is that your take too? We have played pretty good so far. We still have not played our best game. We still have a much higher level of play in us than what we have displayed so far. 3- You have mentioned at the TD Club on Thursdays you feel like your defense has really been a game changer so far this season. Talk about what they have been able to do so far this season. Much like the team as a whole, they have had to grow up the last couple of years. We have scored enough points offensively to win the last two years, but have struggled on the defensive side of the ball. Our confidence level in our defense this year is much higher. Some of our best leaders are on that side of the ball. We have a very good secondary which allows us to be more aggressive with the front seven. 4- You probably expected to be able to score some points on offense with one of the state's top returning QB's, a seasoned offensive line, and your top reciever. There were questions at running back and at receiver beyond Redmon though, but Quez, Brook, and Tremaine have been great at RB, and other than the Rock Hill game (11 drops) the recievers must have been a pleasant surprise for you? Brook Chapman has been one of the biggest surprises on both side of the ball for us this year. It is great to see him playing up to his potential. We still have a lot of room to improve at WR. Its one of the areas where we still have not performed to the highest level we possibly can. Josh Gentry is definitely on his way to changing my perception of this group, though. 5- The region will be full of hard nosed games starting this week at Union. One would look at their record and say they are down, but I know you aren't buying that, as they have played a murderous pre-conference schedule. What does Union County bring into the game that concerns you? Very solid QB, Dangerous weapons on offense, and tremendous DL play. Typical Union. 6- Chapman has shown that they can score. Clinton just went toe to toe with one of the Upstate's better teams in BHP. Blue Ridge is unbeaten and has the state's highest rated QB, and Chapin brings basically the kitchen sink that a defense has to prepare for with their multiple looks on offense. It doesn't look like your team can afford to take a single night off in region play. Really Rob, we are only worried about the one we've got this Friday night. Next week we will worry about the next one. 7- And finally Coach, where is this team relative to where you want them to be at this point in the season, and what can they improve on? And again, thanks for your time. I think I answered this one - We are in pretty good shape right now. Still growing and tweaking. Need more consistency on PAT's. More consistency at WR. The following article was done after the 2010 football season. As usual the YJSN would like to thank Coach Young for taking with us. NOTE: THE QUESTIONS ARE IN BOLD PRINT - COACH YOUNG'S ANSWERS ARE IN NORMAL PRINT! 1- Let's start with the last game. Your team looked like they gave BHP everything they wanted for more than half the game. Talk about that game and how the team played. I thought we did come out ready to play against a very good BHP team. We allowed the unfortunate fumble return for a TD in the 3rd quarter to derail our efforts and that should not have happened and that is still disappointing. Our team faced plenty of "bad breaks" throughout the season and we have to do a better job of coaching them to move beyond those. 2- Lots of people have been pointing to this group of guys (the 2010 & 2011 teams) for 2-3 years now, saying that this group has big-time potential. Based on the way things panned out this year was that a fair expectation? Did this group underachieve? If so, what went wrong? I think it is a fair expectation every year at Greer High to see big-time potential from our football program. Does that potential always pan out? The answer is no. If you look at the players we have returning for the 2011 campaign you get the sense that we were still relatively young, but not inexperienced in 2010. The most disappointing aspect of the 2010 season is losses to teams we should have beaten. Did this team achieve what I personally felt they were capable of achieving – the answer again is no. We will work extra hard this off-season to correct that. 3- Not finishing high in the Region standings puts a team in the unenviable position of going on the road to face high seeded teams. The last two seasons we weren't able to close out home field advantage with late season wins. How can we re-claim that famous Greer "swagger" that entitles a win in those types of games? You reclaim swagger by winning plain and simple – Sometimes that sense of entitlement can be a detriment to success. Winning occurs through hard work, intense concentration in the heat of battle, and players capable of executing the game plan. 3 out of the last 5 years we have either won our region outright or tied for 1st. 4- You scored enough points to win most games with the exception of Greenville & BHP at yet you were firmly in both of those games at halftime. Talk about your take on the offense this year. There is an old saying that if the other team can’t score more than you you’ll win. My philosophy is if you score more than they do you’ll always win. The best thing we did this year offensively was to get away from being 1 dimensional. We presented a balanced attack led by our QB and WR’s. We distributed the ball effectively to a number of different players. What we lacked this year offensively was the Homerun threat that we’ve had with Dominique in the backfield. I think we have a handful of young players who will give us that homerun threat next year. 5- The "Saturday Morning Quarterback" talk was as the season unfolded, the offense got more & more predictable. What would you say to that? I would obviously disagree with that statement. We were more balanced and thus more unpredictable on offense than arguably at any time in the history of the program. The chart below is a breakdown of plays called in the 3 games leading up to BHP. If you do the same comparison for the entire year you can’t hardly see the slices of the pie due to the sheer number of different things we present to the defense on week to week basis. It is important to note that we did finish atop our conference in total offense and scoring offense. Are there plays that we hang our hat on – absolutely. Any good offense better excel at something. If you use the chart please mark through the play names. NOTE FROM ROB: Coach Young included a play chart with his email that had a chart that showed the plays from the last 3 games leading up to BHP. I did not want to post this chart on the internet for all to see, as it includes plays & play names. But I will tell you that in those games, the Jackets ran a total of 41 different plays. There were four specific plays that they ran more than others. They ran these plays 10%, 9%, 9%, and 10% of the time. Without being too specific, there were four of those plays out of the 41 they ran more than others. Translating, Greer High averaged running 69 offensive plays in a game, they averaged 217 over three. (the high this sesason was 86 plays, and the low was 56) If they ran Play A 10% of the time, then that means they ran Play A 22 times in three games. Breaking it down to a per game basis, they would have run play a about 7 times. Using these numbers with the four plays they ran most often, out of 69 total offensive plays, they ran those 7, 6, 6, and 7 times in a game. That’s 26 of the 69 plays that ended up being a play that Coach Young implied as "you better excel at something." That means 43 of the 69 average plays per game were spread out among others in the playbook. Some of those plays were 1%, some were 2 and 3%, and a couple were as high as 6%. I wish I could share the chart with you, but for obvious reasons I won’t. The chart does show quite a bit of diversity, however. 6- The defense seemed to have a lot of ups and downs this year. They definitely had their moments where they played outstanding. But they also gave up some huge plays. Talk about the defense. I think we did improve our secondary play quite a bit. As you mentioned some of those big plays were given up in secondary, but when you compare 2010 to 2009 there has been substantial improvement, especially fundamentally, by our DB’s. Remember that most of those young men will be back next year and should develop into a strength of our team. We have to find LB’s that can run and play well in space. We also have to dramatically improve our tackling fundamentals at all positions on defense. 7- In the regular season every loss could be attributed to one or more big plays. Just in the Region losses, there was the 97 yard TD against Union, 75 & 32 against Blue Ridge with a 47 yarder that set up a 3 yard run, and 83 & 32 yard plays vs. Chapin. Greenville had two long pass plays, and Rock Hill had 60 & 61 yard plays. They seemed to have long stretches where they were fairly dominant, then they would give up a big one. Is a big play usually just one player missing an assignment? How the "big-play" problem correctable? See the answer above – There are some plays that are attributable to a single player missing an assignment or using poor technique. It is our job as coaches to make sure that neither occur. There are times when an offensive scheme dictates that an LB cover someone – once again see above. We do have some young LB’s coming that can run and can play in space. Improvement in tackling fundamentals will go long way to reducing big plays also. 8- Every team has some good seniors that you hate to say good-bye to. Darius Murry and Matt Rochester have made the Shrine Bowl and the North-South games. Talk about those guys and some of your other senior starters who wont be back next year. Offensively we lose Jihad Lateef, Quadric Mack, Dakari Sitton, and Matt Rochester. Defensively we lose Daris Murry, Mario Sanders, Byron Thompson, Jihad Lateef. Although we always hate to say goodbye to seniors we are really pleased with the young talent that will fill those slots. 9- Turning to the present, how do you go about evaluating the season from a Head Coach standpoint. What and who do you evaluate? I evaluate every aspect of our program – from how we conduct our off-season training to the pre-game meal we eat on Fridays. One of things we did in 2010 consistently, was to shoot ourselves in the foot at the worst possible times. Why did that occur? I don’t believe in luck (good or bad) so what is the root cause. We meet as a staff in December prior to the Christmas break to discuss and hash out what worked and what didn’t and why. We will then develop a plan of attack to correct those problems and begin to implement that plan the first of the year. I also look at the members of our staff to see if everyone is being used in the most effective manner possible for our players. We will have some changes in staff responsibilities for the 2011 campaign. We will bring in coaches from outside our program to look at what we do both offensively and defensively (play Saturday morning QB if you will) and listen to their suggestions for improving what we do. All of our coaches will research the latest techniques for fundamentals, trying give our players the edge they need to be successful. 10- High school football isn't like college where if you don't like a player at a particular position you just go recruit another player. But I guess you can look at position changes, to see where a guy might be better utilized in another spot? We do look at position changes and are currently looking at where our kids fit into the plan for next year. The number one job of a high school coach (from a football perspective) is to get players to play fundamentally sound football. You may not always have great athletes, but they should always be fundamentally sound. 11- Players going "both ways" seems to be less & less. Some teams uses players on offense & defense, but that is not done as much as in the past. You seem like you try not to play a player both ways. I suppose practice time, stamina, and injury concerns (when you lose 1 player you lose 2) all factor into that? That is an odd question – we played more kids both ways this year than we have in a long time. Daris Murry, Jihad Lateef, Josh Rowland, D’Anta Fleming, Jared Ensley, Mario Sanders, Jarvon Walker all saw time on both sides of the ball. All of our players practice both ways. When you get down to it, in our division, the less that play both ways the better for the reasons you mentioned above. We do, however, attempt to get the best 11 on both sides and work from there. 12- You have a lot of kids coming back next year. Hopes will be high again for the 2011 season I'm sure. You are right and they should be. 13- Let's look at the returning offensive positions and what you expect. Quarterback? You have two guys that would start for most high school programs. Is that a blessing or a curse? Absolute blessing – Reese will be our starter heading into 2011, but having Taylor allows us to some things at the QB position that would be a little more stressful without a quality backup. I expect us to be outstanding at QB. We have been able to diversify our offense primarily because of play at that position. Running Backs? Dakari Sitton was really the only guy that produced here and he's gone. Since I’ve been here we have not had a RB that hasn’t produced. Dakari had right at 1000 yards and missed most of the year. We have some talented kids coming up that will fill that role. Wide-Recievers? This was as talented and deep a group as I can remember maybe ever at Greer. All but one return. All but two – Jihad and Quadric. This group should be a strong point again for the 2011 season. Offensive Line is your coaching responsibility. You lose Rochester but you return most of the unit. Offensive Line? We return 4 starters – all four will be seniors – we also return Alex Waters who started for us during the 2010 campaign. Those boys know what we expect out them and will be a solid group for us in 2011. Defensive Line? Murry was a Shrine Bowler there, and he's gone along with Duke-bound Mario Sanders. But you do have some talent returning. We have John Dawson, Jarvon Walker, Dontavious Boyce (can play DE or LB) returning. All three have the potential to be great players for Greer High. We also have some young big men coming up from JV and C that will help anchor the interior. We feel that this group should be a strength of our team in 2011. Linebackers? Early in the season this year this spot was a concern, but they seemed to improve a lot. Adam Ah Ching improved greatly from his 10th to 11th grade year – still has room to improve. We have to look at these kids coming up who can run and play well in space. For much of our schedule we play teams who spread it out. We need to change our mindset of what an inside linebacker is. Defensive Backs? This group had some big plays but also gave up some. I think I already answered this, but compared to where we were DB wise to where we are now is a vast improvement. They will only continue to improve. Most of these are back too. 15- Kicking game: You had your bumps there in the first half of the season in the kicking game, but there seemed to be a big improvement there in the 2nd half. You lose Jake McKown but Derrick Davis returns. Punter & Kicker? We will lean more on Derrick for FG’s/KO and look to Josh Cooke to take over the punting duties. We believe that both of these kids can be outstanding specialists with the right teaching. We will camp both of these kids this summer and continue utilizing former Greer standout Nelson Welch in getting the young men the fundamentals they need to be successful. 16- The D-Team, and C-Teams had outstanding seasons. The JV squad didn't do as well but still managed a winning year. Most of the D-Team kids are still a year or two away from helping, but do you anticipate any help coming from the C-Team or JV guys on the Varsity level next year? We think there are linemen on the D-Team that will be able to fill some backup roles for us on Friday night. The C-Team (9th grade team) has several tremendous athletes who will probably not play on Thursday night again. There are some JV’s who will contribute as well. 17- Back to the two quarterbacks thing. If one is your starter and the other, as you say, is "slightly behind" the starter, then obviously the 2nd guy is a great athlete. How do you go about getting that kid on the field somewhere, if not QB? We used Taylor last year as a WR – particularly in our empty sets. That is the easiest way to do it because as QB he obviously must be familiar with the routes. 18- I guess the next few months are when coaching changes, scheme changes, preparation changes, etc are made in a high school program. I wouldn't ask you to comment on personnel issues, but do you anticipate any changes in the way you do things? We will probably have some personnel adjustments after I finish with the evaluation of our program. We are already looking into the way we conduct our pre-season preparations and will be making adjustments on that. Coaches from both sides of the ball will be attending colleges to pick up on the latest trends (both fundamentals and schemes). Will we wholesale trash everything we’ve done? The answer is no. But we will spend the next few months trying to find the next great play or the next great blitz or look at better ways to teach our kids what to do. 19- What's going on now inside the football program? Tell us what the winter off-season program entails and when that gets rolling? It officially got rolling on November 29th. We begin by testing the kids to see where they are now after 3 months of in-season training (most have gotten stronger). We will work the 3 weeks prior to Christmas holidays then pick up when we get back after exams. The players work on a 4-5 week strength cycle with a test occurring at the end of each cycle to determine whether not sufficient growth is occurring. We will begin implementing speed and deficiency training in January led by our strength coach Chas Crenshaw. Our QB’s and WR’s will start throwing on their own in late January. We continue this up until Spring Practice and conclude the winter off-season with our Spring Game at Dooley. 20- Lastly, what would you say to the Greer High faithful who want a some new paint on that water tower at Dooley Field? First – keep being faithful, these kids deserve all the support you can give them. Second – you need to get some black paint and stencils that read 2-0-1-1. NOW THATS A "SIGN" THAT WE CAN ALL LOOK FORWARD TO! 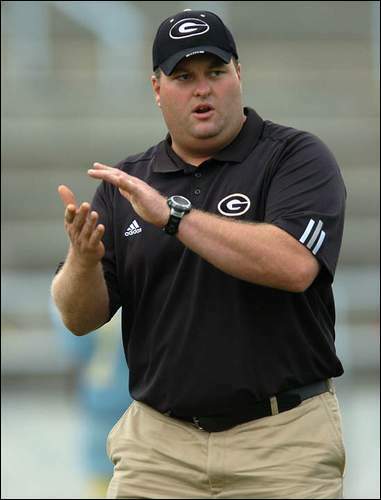 THANKS AGAIN TO COACH YOUNG FOR THE INSIGHT INTO GREER HIGH FOOTBALL!